Recorded on January 1, 2012. 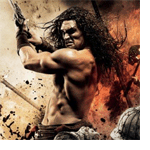 Gutter Trash rings in the New Year in the most appropriate way, with 2011’s Conan the Barbarian. Since it is the last year ever, we begin to plan our big “going away” party for next December. We also talk about resolutions and Conan comic books. Finally we have a short discussion on the comics The Red Wing and Havok/Wolverine: Meltdown. First off there is exactly one Robert E Howard Conan novel (it’s called Hour of the Dragon) & it’s fine. As far as the short stories are concerned, the best to me are “The Devil in Iron,” “Red Nails,” “A Witch Shall Be Born,” & “Jewels of Gwahlur.” But really stick to the stuff that doesn’t have the pastiche where people credit Howard as a co-author when they made stories based on a vague plot line in a letter to a fan. For the non-Conan stuff, there’s a story called “Pigeons from Hell” & I really dig the Solomon Kane stuff (I think there’s a book that’s about 300 pages that collects all the Solomon Kane stuff). None of the Howard sports or cowboy stories have really stuck with me as memorable. I suppose if I were to make something new as an editor, I would do something with collecting some of his tales of local ghost stories & such from his letters to friends & fans as I think his voice shines the more casual he is. That Havok/Wolverine Meltdown book I remember buying as it came out full price. I remember even then thinking the words/story sucked, but I found the artwork really interesting. & I think back then the artwork was pretty freaking edgy & awesome, but I’m kind of a sucker for that somewhat sketchy version of painting for comics. I also think that might’ve kinda been a re-introduction to Havok who hadn’t really appeared for about 5 years previous to that. I also think it pre-dates Wolverine having his own monthly series. So at the time it was exciting. I’d be willing to try to do something where I try to take the comic & white out the words & put new ones to tell a better story to go with the art if you want to mail it to me…. Bear in mind that I was 10 when Havok/Wolverine came out, and to me if John Byrne didn’t draw it, then I wasn’t interested. Nowadays, I’ll take Kent Williams over Byrne anytime, but I’ve grown to appreciate different things. Havok actually rejoined the X-Men in issue 219, making a couple appearances a few issues beforehand. This was after the Mutant Massacre storyline, and just before The Fall of The Mutants. During The Fall story, The X-Men died, but unbeknownst to the rest of the world were resurrected. They decided to remain “dead” and moved to Australia, where they were rendered undetectable by electronic equipment. It’s during this timeframe that Havok/Wolverine takes place in. Wolverine # 1 (ongoing) came out the exact same month as H/W:M # 1. And yeah, I’ve owned the books for about 15 years now or so, and no matter how terrible it was, I’m not gonna part ways with it just yet. I’ll just bury it under a stack of Marvel Comics Presents.